Honeymoon Offer – Stay for your honeymoon and save up to 40% off the room rate. Please contact us for further details. Four Seasons Mauritius is an ultimately luxurious property, with jaw dropping views filling your every gaze. The perfect sanctuary for any honeymoon couple, the Four Seasons is grand in design and has unlimited privacy for your intimate holiday. With a private plunge pool in your villa, the hotel can cater for private dining experiences, with sensational cuisines on offer. 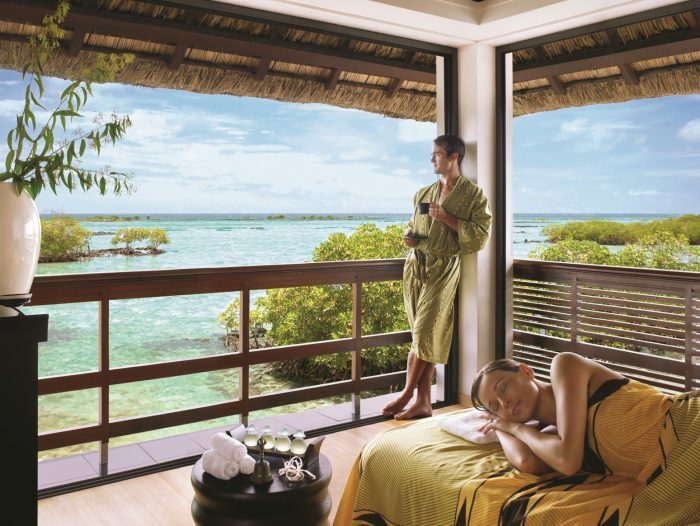 Indulge in signature couple’s spa treatments on stilted overwater treatments areas – experiences to be cherished, with ingredients being handpicked from the Four Seasons gardens. The charm and tranquillity that this property breeds is only excelled by the emerald gardens, fascinating views and the gorgeous warm seas. The palm trees are fresh, the papayas locally grown and the Four Seasons becomes home for your honeymoon. Early Booking Offer – Stay at least 5 nights and save up to 30% off your room rate. Honeymoon Offer – Stay for your honeymoon and save up to 40% off the room rate. The Four seasons Spa is contemporary and Mauritian in style, with open-air over-water pavilions, featuring wooden floors and decks. There are a total 12 treatment rooms. Facilities include stilted overwater treatment suites, spacious outdoor & indoor relaxation areas, and an extensive spa boutique. Four Seasons Mauritius is a sight for sore eyes; a perfect haven for any holiday maker, this resort is an absolute delight. Hosting a rustic yet contemporary interior, each villa is spoiled with a private plunge pool, outdoor showers and lush green gardens. With the intense beauty of the villas and the electric colours and aromas that grace your senses, you can meander through the resort on complimentary bicycles to explore the natural beauty that Four Seasons has to offer. Choose from an 18 hole golf course, tennis courts, four pools to fill your lazy days or hang out with the aladabra tortoises, a completely unique experience at the Four Seasons. Travelling as a family, the breathtaking views make an incredible backdrop to some amazing onsite and offsite activities, including cooking classes, Culture centre, Kids’ Club, wakeboarding, segway safari and zip lining. Restaurants and bars at the Four Seasons offer exquisite dining experiences that are as intense in flavour as they are beautifully cooked to perfection. For a lavish vacation, the Four Seasons Mauritius is breathtaking. In such a beautiful hotel, the dining is no less. Acquapazza is a stunning Italian restaurant overlooking the lagoon. Al fresco Italian dining is further accentuated by the wine list which is so extensive it will make your heart content. Local produce and grilled seafood are just some of the delights to be enjoyed. Beau Champ is a magnificent indoor and outdoor grill as the aromas gulf, the textures sensualise and the food melts in your mouth. Try the Angus Beef Burger and the River Prawns for meat so fresh it’s heavenly. Bambou with its thatched roof and chilled out environment is a fun restaurant to eat at. International dishes are tossed in woks, grilled and rolled right before your eyes. The themed evenings gives you great tasting signature dishes to eat your night away.